While some have argued that films or television shows based on comic books are held to a different standard of logic than shows set in the “real world,” “Damaged” is invested in reconciling a potential flaw in Arrow’s premise. 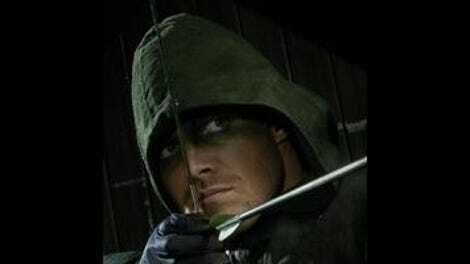 If a crime-fighting vigilante suddenly appears in Starling City at the exact same time Oliver Queen returns from exile on a deserted island, how long would it take before someone—perhaps even the detective whose daughter was killed while with Oliver?—would put the pieces together? It’s a question that could be raised in any adaptation featuring a comic book character that keeps his or her identity a secret, and something that could keep the adaptation from seeming sustainable. There is usually a large enough collection of coincidences that anyone following standard logic would probably come to this conclusion, which is precisely why standard logic need not usually apply. And yet “Damaged” shows an Oliver who has a plan to solve this potential problem, allowing himself to be arrested based on circumstantial evidence and then using his newfound partner in Diggle to ensure he’s comfortably under house arrest while another attack takes place. In truth, the logic of this plan doesn’t actually hold up: He didn’t have Diggle in his corner when he was caught on that surveillance camera, which meant he had no guarantee that he would have someone who could act as the Arrow in his place. Perhaps he had simply hoped to have someone sooner than later, but it still implies a degree of forethought that doesn’t line up with the show’s narrative. In addition, “Damaged” follows a rather nonsensical legal process that ignores any existing logic in favor of ideal circumstances for the episode’s storytelling needs (such as the always popular “Just To Prove a Point Polygraph”). Oliver may be trying to overcome the traditional gap in superhero logic, but Arrow is less interested in moving away from the makeshift logic of television plotting. And that’s fine. “Damaged” works in part because it doesn’t rely too heavily on the problem-solving gymnastics to justify its narrative purpose. 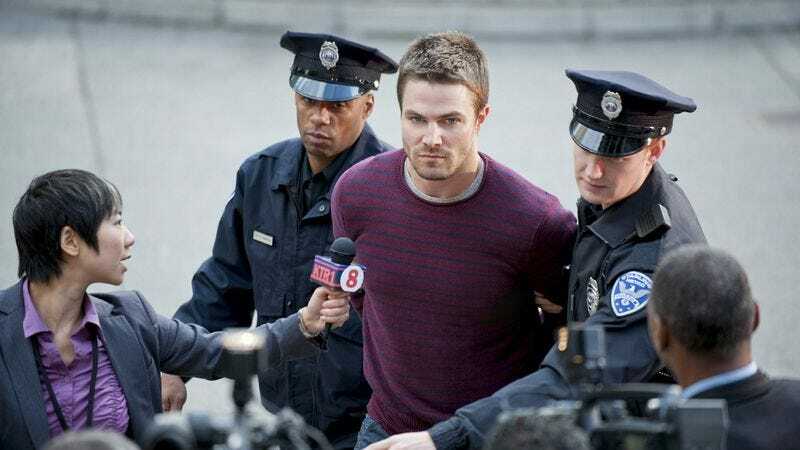 While the episode does solve a problem the show would need to address eventually, leaving room for Oliver to fight crime without the pending threat of discovery and prosecution, it also emphasizes again that there are problems Oliver isn’t able to solve. For every part of the episode where Oliver seems in complete control of his elaborate ruse to ensure his safe release, there is another part where his resolve breaks ever so slightly. While he may not be insane, it is safe to say that the persistent flashbacks and nightmares are consistent with a case of PTSD, something that Oliver hasn’t yet confronted. Even with Diggle, the one person he can actually talk to about this, he still has his guard up: He may say that he struggles with his lies more than those who love him, but he’s also lying to himself to keep from accepting the role that struggle is playing on his quest for justice (or, depending on your perspective, vengeance). This theme isn’t new for the show, but the flashbacks finally feel like they are working toward revealing the cause of his pain, as opposed to simply reminding us of it. Whereas previous flashbacks have been on-the-nose, establishing basic themes in basic terms, the confrontation with the insurgency was a nice bit of reworking of his origin story (which is really how these flashbacks are operating, albeit spread out over an extended period, something that didn’t connect for me until they got more interesting this week). That his scars have a more sinister origin—inflicted by mercenary Deathstroke at the behest of a man searching for Arrow’s mentor (revealed to be a former soldier)—reframes his experience as actual torture, as opposed to a generic torturous experience. The CW isn’t in a position to render torture as viciously as one would expect from 24 or Homeland, but the idea is still effective at bringing the character’s psychological struggle into perspective. Although Ollie seems to reveal the information to Laurel and her father as part of his larger strategy, the concurrent flashbacks to the polygraph suggest memories that are not so easily used and tossed away, and something I would expect the show to return to (particularly given the consistency with which flashbacks have been used thus far). The remainder of the episode is an attempt to make the show’s larger ensemble part of the same conversation. Diggle’s speech at the end of the episode is not particularly subtle about trying to pull the threads together, and while cheesy, it’s doing important work for the show’s future. Moira’s involvement with John Barrowman’s shady organization was the pilot’s big reveal, but Susanna Thompson didn’t have much to work with until Walter stumbled onto her secret and left her as a result. The conspiracy is still rote—and remarkably similar to what ABC’s Revenge is doing with “The Initiative”—but refocusing on Moira’s choices has the potential to pull the storyline together, and Walter’s departure gives her real human stakes that nicely—if too cleanly—parallel Oliver’s own lies and the emotional costs therein. This is not to say the speech can tie everything together, as Laurel Lance remains the show’s biggest struggle. The writers want the romance to work, but they’ve been unable get free from the “We can never be together” cliché to find a different gear. This perhaps seems premature, given that we’re only five episodes into the series, but it already seems played out, suggesting that the character just doesn’t fit comfortably into the show’s larger framework except as the stereotypical love interest. While her involvement as Ollie’s lawyer keeps her close to the central storyline this week, the attempts to reframe the character relative to her father are betrayed by more on-the-nose dialogue. That her mother left is a valuable detail, and it does serve to frame Laurel and her father as victims of the conspiracy and Ollie’s lies, something that the end montage does nicely. However, every time the show feels it needs to tell us this information instead of showing us, the narrative grinds to a halt, raising questions about what the show can do with Katie Cassidy to solve its Laurel problem (and, depending on where that goes, whether Cassidy is up to the task). “Damaged” isn’t able to solve Arrow’s Laurel problem, but I do like that it isn’t set on solving all of Oliver’s problems in a single sweep. That the show is so willing to leave Oliver damaged is in its best interest, leaving room for interpretations of his actions that stray from the typical realm of the heroic. While far from marking him as an antihero, there is a menace in the way Oliver confronts German arms dealer Leo Mueller at episode’s end, a menace the show would do well to maintain. It’s easy to root for a true hero, but I’m not convinced it’s entirely interesting. “Damaged” still sees the show working out some kinks, but that it’s avoiding becoming too clean and straightforward is ultimately to its credit moving forward. I tried to do my DC homework this week and read up on Deathstroke a bit, but then the episode didn’t really do much with the character beyond use him as an intimidating mercenary. I’ll be interested to see if the writers pursue that line in the future: The back-story suggests there is plenty of material to work with. Related: There’s a fun congruence between fiction and reality in that Oliver and Diggle talk about how someone just has to be in the hood, and then the producers cast a stuntman as Deathstroke to avoid having to cast an actor (which they will have to do if/when he gets lines). It did result in what I found a visceral fight scene in the tent, though, an improvement over last week. Adventures in Bad CGI: That bunny and arrow combo in the opening flashback was a mess. Adventures in Stereotypes: The costume department should be ashamed for those gangbanger outfits, on both the African and Asian gangs. Ridiculous shorthand, deployed indiscriminately. Per last week, Oliver still isn’t moving his arms when he talks. Are they made of lead? I must learn more about this acting choice. Someone should ask Amell about it on Twitter. Alasdair should be back in time for next week’s episode; thanks for having—putting up with?—me, and we hope to return you to your regularly scheduled “Actually knows specific details about comic books” reviews in due course.